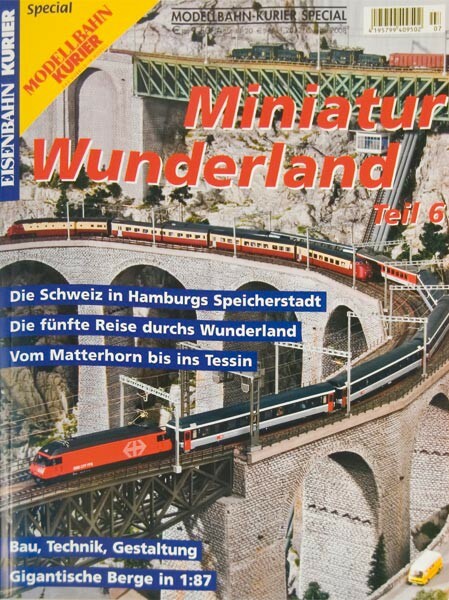 Shortly after the opening of Scandinavia (see issue 4), the Miniatur Wunderland started a new, even more spectacular building section. In order to render the Swiss Alps to model size, the ceiling of the 3rd floor was opened in an area of 100 square meters ( 1,076,39 sq ft ). The mountains tower over two storeys high and some summits reach a hight of more than 5 meters ( 16.40 feet ). The visitors walk through a deep gorge to reach the third floor and on their way down experience highlights like the Matterhorn, the Glacier Express, and an underground world. Many special effects, like an open air concert complement this unique attraction. The opening of this new section was celebrated in November 2007 gefeiert werden.